Have you noticed that lately an increasing number of tweets from famous people are tagged “via WhoSay”? What is this WhoSay app — and if it’s good enough for Steven Tyler and Tom Hanks and Eva Longoria, can you use it too? WhoSay, it turns out, is a sort of HootSuite for the stars, helping them manage their social media presence and making sure photos and videos are posted on a page the stars themselves can control and eventually monetize. I spoke with WhoSay CEO Steve Ellis yesterday about his 18-month-old company and what it has accomplished so far. First, the start-up basics: Los Angeles-based WhoSay has raised $6 million from investors including Amazon and High Peaks Ventures. The premise for WhoSay was developed at Creative Artists Agency but now the company works with all sorts of talent agents and managers. Ellis himself previously sold his start-up Pump Audio to Getty Images. The WhoSay product, which has been out for nine months, has hundreds of users, and they collectively have 570 million social media fans across Twitter and Facebook and get “multiple tens of millions of page views per month,” said Ellis. More than half the content posted on the service is uploaded directly from WhoSay’s various mobile apps. WhoSay doesn’t offer a public index of all its clients, though it’s obvious who’s using WhoSay since the pages themselves are all public at WhoSay.com and their tweets use the URL shortener Say.ly. Other users include Ellen DeGeneres, Dwayne Johnson, Diane Keaton, Gwyneth Paltrow, Sarah Silverman, Cristiano Ronaldo, Shahrukh Khan, Steve Martin and Katie Couric. “Our clients create value in media space but don’t get return for that value,” said Ellis, pointing out this includes both new media and old media — huge amounts of entertainment coverage is driven by pictures and videos from the lives of stars, taken from their own Twitter posts or bought from paparazzi. Any social media service will retain at least some control over the rights to use and monetize the content its users upload. WhoSay, by contrast, says it won’t do anything without its users’ permission and without paying them too. “This will never be a consumer application,” Ellis said, though he added that he can’t exactly specify the criteria for admitting WhoSay users. Today WhoSay is primarily television and movie stars, and the company hopes to beef up its sports, politics and finance roster. WhoSay does advise stars to post their own updates, but Ellis says he always tells them “Authenticity doesn’t mean you have to tell people what you had for lunch.” For instance, Diane Keaton often posts pictures of art she finds interesting. Tom Hanks has created his own series of publicity stunts for his new movie “Larry Crowne” (I had no idea Tom Hanks was such a goofball). James Franco used WhoSay to post videos from his iPhone while he hosted the Academy Awards (though he appears to have since deleted his social media presences). But Cristiano Ronaldo’s most-viewed WhoSay picture of all time is indeed a picture of his plate of food (I think it’s this one), Ellis said. 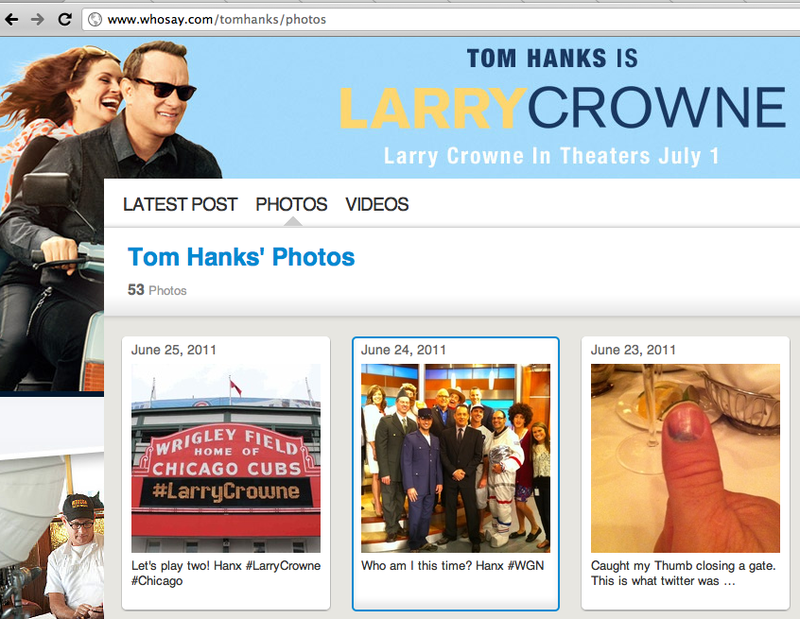 Today WhoSay integrates with four platforms: Facebook, Twitter, YouTube and Myspace. Next will be Tumblr and international social networks, especially in China, Ellis said. The company has also started doing larger deals, for instance signing up all the contestants in the recent Miss USA pageant. The next big thing, Ellis said, will be commercializing the service with an ad sales partner, which is coming soon.